Type B aortic dissection (TBAD) is a complex clinical condition requiring rigorous understanding of the pathology and the patient’s unique individual characteristics. Aortic dissection is generally classified by anatomic criteria in addition to chronological information (acute, subacute, and chronic) and information about the clinical presentation status (complicated or uncomplicated). Anatomically, dissections can be classified as proximal, with involvement of the ascending aorta or the aortic arch (Stanford type A, DeBakey types I and II), or as a distal dissection without involvement of the ascending aorta (Stanford type B, DeBakey type III). Figure 1. An acute TBAD with a large entry tear and true lumen collapse. Invasive management of acute complicated type B dissection has changed considerably over the past 2 decades, with endovascular repair becoming the treatment of choice in these patients, even though long-term evidence regarding durability is still lacking (Figure 1). Compared to open surgical repair, TEVAR offers clear benefits in terms of favorable outcomes such as operative morbidity and early mortality rates.4 Additionally, TEVAR offers better quality of life and is associated with lower costs at 1 year compared to open repair.5 Thus, TEVAR should be offered as the first-line therapy in cases of complicated TBAD. Open repair should be reserved for patients with connective tissue disorders in whom excellent results with open repair were previously reported. The treatment goal of TEVAR for acute complicated TBAD is to seal the primary entry tear with a stent graft and depressurize the FL by redirecting flow into the true lumen. In cases of malperfusion or limb ischemia due to true lumen compression or collapse, redirection of blood flow to the true lumen is most effective in the reperfusion of the affected visceral and renal side branches, as well as the iliac arteries. In the INSTEAD-XL study, TEVAR was able to achieve a reduction of all-cause mortality (11% vs 19%; P < .05), aortic-related mortality (7% vs 19%; P < .05), and total diameter change (27% vs 46%; P < .05) at 5-year follow-up compared to optimal medical treatment alone.6 Both INSTEAD-XL and IRAD suggested that favorable remodeling is achieved in TBAD compared with the best medical treatment alone. Figure 2. The formation of a FL aneurysm of the thoracic aorta. Over the past few years, several publications have suggested anatomic factors that indicate a complicated TBAD apart from the typical parameters, such as rupture, an aneurysm > 55 mm, or malperfusion that predicts aneurysmal dilatation and late adverse outcomes (Figure 2).7-9 Predictive factors for late complications of TBAD are early dilatation of the thoracic aorta > 40 mm, presence of a FL diameter > 22 mm, proximal entry tear size ≥ 10 mm, and also its location at the inner aortic curvature or close to the left subclavian artery.7-9 Furthermore, recurrent pain and refractory hypertension appeared as clinical signs associated with increased in-hospital mortality, particularly when managed medically (17.4% vs 4%, respectively; P < .01). Defining uncomplicated TBAD has become a challenging task, and more frequent aortic interventions, such as stent grafting, may be indicated. What Is the Exact Definition of Malperfusion as It Pertains to Acute TBAD Treatment? Figure 3. 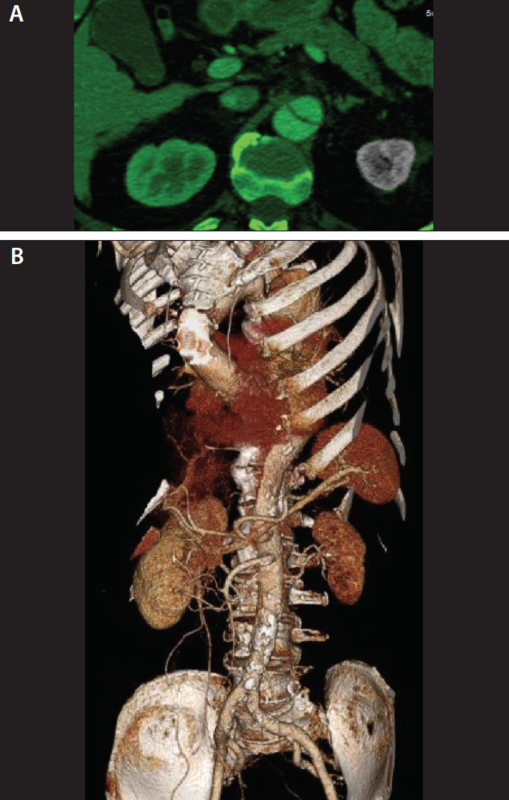 An axial (A) and three-dimensional reconstruction (B) CT scan of a patient with a shrunken right kidney 3 years after “uncomplicated” TBAD. Although consensus papers and guidelines agree that renovisceral malperfusion after TBAD should be treated by urgent TEVAR, strict definitions for malperfusion have not been established. Perfusion occurs in the false lumen of approximately 20% to 30% of all renal arteries, often resulting in a delayed uptake of contrast during the CT scan. However, some patients with no apparent radiographic signs of renal malperfusion experience a deterioration of renal function after the index event (Figure 3). Although ultrasound of the renal arteries could provide useful information, it does not exclude a “silent” deterioration of renal function due to chronic malperfusion. More precisely determining which patients have chronic renovisceral malperfusion after TBAD will likely be an important factor in determining the optimal treatment strategy. Is the PETTICOAT Technique Effective in Promoting Aortic Remodeling? The combination of a proximal stent graft for coverage of the entry tear with an uncovered stent (PETTICOAT technique) remains a treatment option in patients with persistent malperfusion or true lumen collapse.10 Although true lumen visceral perfusion is achieved after placing the main covered stent graft component in the majority of cases, some patients require additional measures to restore adequate flow to all renovisceral vessels. 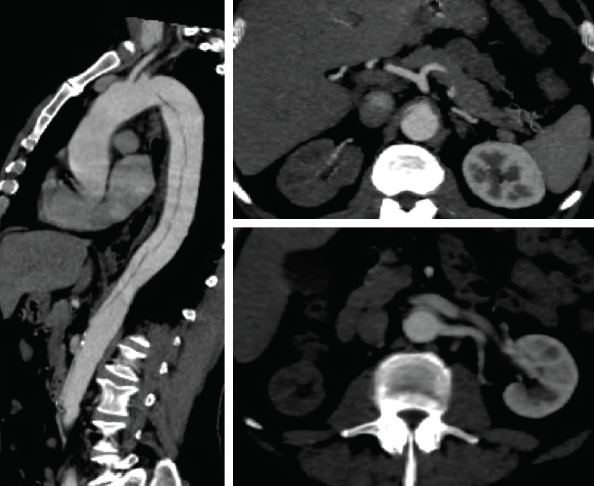 How Should We Treat an Acute Type B Dissection With Retrograde Involvement of the Arch? Intramural hematoma of the ascending aorta is seen by cardiovascular surgeons as an indication for open surgery, which includes supracoronary or hemiarch replacement of the ascending aorta.2,13 This recommendation does not differentiate in regard to the location of the primary entry tear, which may be sufficiently treated by TEVAR in the case of retrograde arch and ascending aortic involvement. We do not currently have enough evidence to answer the question of whether these patients should be treated with standard TEVAR or if open arch repair should be recommended to reduce the risk of retrograde type A dissection. How Much Should We Oversize Distally to Avoid a Stent Graft–Induced New Entry Tear? What Is the Best Timing for Intervention in TBAD? Although resistance to stenting in uncomplicated TBAD has largely decreased with the results of the INSTEAD XL study, it is still unclear whether stenting in the acute phase (0–14 days) is associated with more negative outcomes in comparison to best medical therapy. A higher risk for retrograde type A dissections has been postulated, and the dissection membrane might be more vulnerable, thus increasing the complexity of the repair. Most operators prefer a time window between days 15 and 90 for TEVAR in TBAD. What Will the Role of FL Occlusion Techniques and Fenestrated/Branched Endografts Be in Treating Chronic Dissections? Figure 4. Thoracic FL embolization techniques with a Knickerbocker graft (A), a Candy-Plug graft for thoracic FL aneurysms (B), and a fenestrated/branched endograft for a postdissection thoracoabdominal aneurysm (C). The need for a better understanding of this complex disease, whether in the acute or in the chronic phase, is indisputable, and it remains a controversial topic that often confronts physicians with unanswered questions. 1. Dake MD, Thompson M, van Sambeek M, et al. DISSECT: a new mnemonic-based approach to the categorization of aortic dissection. Eur J Vasc Endovasc Surg. 2013;46:175-190. 2. Hiratzka LF, Bakris GL, Beckman JA, et al. 2010 ACCF/AHA/AATS/ACR/ASA/SCA/SCAI/SIR/STS/SVM guidelines for the diagnosis and management of patients with thoracic aortic disease: a report of the American College of Cardiology Foundation/American Heart Association Task Force on practice guidelines, American Association for Thoracic Surgery, American College of Radiology, American Stroke Association, Society of Cardiovascular Anesthesiologists, Society for Cardiovascular Angiography and Interventions, Society of Interventional Radiology, Society of Thoracic Surgeons, and Society for Vascular Medicine. Circulation. 2010;121:e266-e369. 3. Carpenter SW, Kodolitsch YV, Debus ES, et al. Acute aortic syndromes: definition, prognosis and treatment options. J Cardiovasc Surg (Torino). 2014;55(2 suppl 1):133-144. 4. Fattori R, Tsai TT, Myrmel T, et al. Complicated acute type B dissection: is surgery still the best option? A report from the International Registry of Acute Aortic Dissection. JACC Cardiovasc Interv. 2008;1:395-402. 5. Luebke T, Brunkwall J. Cost-effectiveness of endovascular versus open repair of acute complicated type B aortic dissections. J Vasc Surg. 2014;59:1247-1255. 6. Nienaber CA, Kische S, Rousseau H, et al. Endovascular repair of type B aortic dissection: long-term results of the randomized investigation of stent grafts in aortic dissection trial. Circulation Cardiovascular interventions. 2013;6:407-416. 7. Song JM, Kim SD, Kim JH, et al. Long-term predictors of descending aorta aneurysmal change in patients with aortic dissection. J Am Coll Cardiol. 2007;50:799-804. 8. Luebke T, Brunkwall J. Type B aortic dissection: a review of prognostic factors and meta-analysis of treatment options. Aorta (Stamford). 2014;2:265-278. 9. Evangelista A, Salas A, Ribera A, et al. Long-term outcome of aortic dissection with patent false lumen: predictive role of entry tear size and location. Circulation. 2012;125:3133-3141. 10. Nienaber CA, Kische S, Zeller T, et al. Provisional extension to induce complete attachment after stent-graft placement in type B aortic dissection: the PETTICOAT concept. J Endovasc Ther. 2006;13:738-746. 11. Sobocinski J, Lombardi JV, Dias NV, et al. Volume analysis of true and false lumens in acute complicated type B aortic dissections after thoracic endovascular aortic repair with stent grafts alone or with a composite device design. J Vasc Surg. 2016;63:1216-1224. 12. Nauta FJ, Tolenaar JL, Patel HJ, et al. Impact of retrograde arch extension in acute type B aortic dissection on management and outcomes [published online July 14, 2016]. Ann Thorac Surg. 13. Song JK, Yim JH, Ahn JM, et al. Outcomes of patients with acute type a aortic intramural hematoma. Circulation. 2009;120:2046-2052. 14. Dong Z, Fu W, Wang Y, et al. 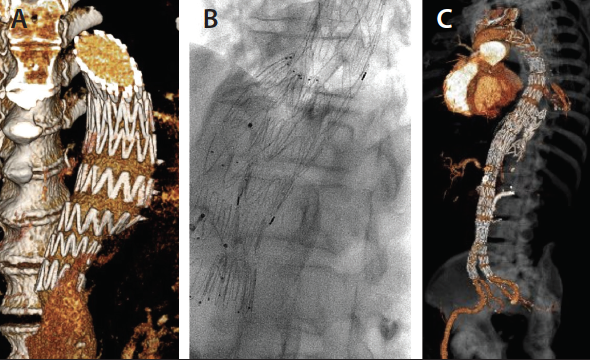 Stent graft-induced new entry after endovascular repair for Stanford type B aortic dissection. J Vasc Surg. 2010;52:1450-1457. 15. Spear R, Sobocinski J, Settembre N, et al. Early experience of endovascular repair of post-dissection aneurysms involving the thoraco-abdominal aorta and the arch. Eur J Vasc Endovasc Surg. 2016;51:488-497. 16. Kölbel T, Tsilimparis N, Wipper S, et al. TEVAR for chronic aortic dissection — Is covering the primary entry tear enough? J Cardiovasc Surg (Torino). 2014;55:519-527. 17. Oikonomou K, Katsargyris A, Ritter W, et al. Endovascular management of chronic post-dissection aneurysms. Ann Cardiothorac Surg. 2014;3:307-313. 18. Kölbel T, Lohrenz C, Kieback A, et al. 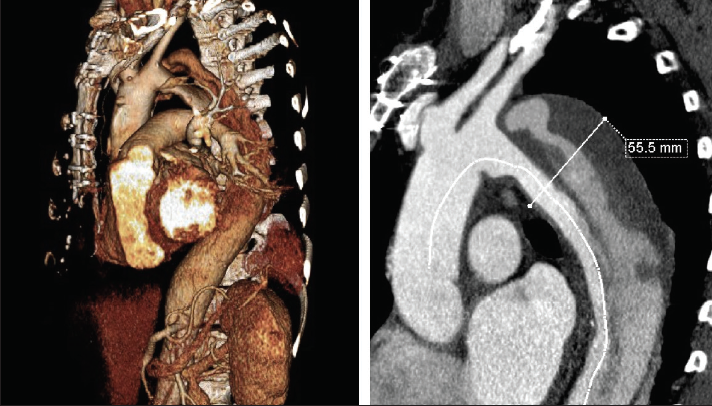 Distal false lumen occlusion in aortic dissection with a homemade extra-large vascular plug: the candy-plug technique. J Endovasc Ther. 2013;20:484-489. 19. Kölbel T, Carpenter SW, Lohrenz C, et al. Addressing persistent false lumen flow in chronic aortic dissection: the Knickerbocker technique. J Endovasc Ther. 2014;21:117-122. Disclosures: Proctor and lecturer for Cook Medical. Disclosures: Holds intellectual property in Cook Medical. A preview of the changes ahead for interventional CPT coding effective January 2017. A discussion of the longevity and durability of commonly used extrathoracic debranching techniques. A review of the etiology, incidence, clinical presentation, and rationale for repair. A review of five devices with investigational device exemptions in the United States.